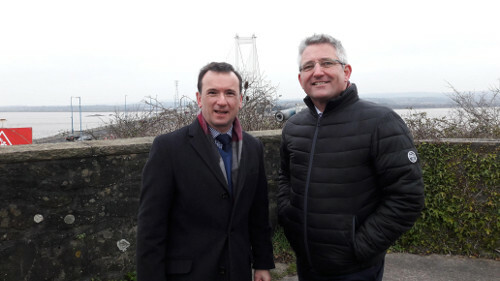 Earlier today, Chief Executive of Bristol Chamber of Commerce & Initiative at Business West, James Durie, accompanied the Secretary of State for Wales, Alun Cairns, to the launch of the new Severn Bridge toll fee schedule. “Business will be pleased to see that the Secretary of State has gone further than the price cut originally promised by the Chancellor in March 2016 and has decided to scrap the Severn Bridge toll altogether by the end of the year. “A significant barrier has been lifted giving the business of South Wales and South West England the chance to work and trade together more, and it is encouraging to see that the UK Government is being proactive in engaging with business communities across both our neighbouring regions. There are some real concerns about the strain in the short term that this decision may have on the road and motorway infrastructure on both sides, particularly with more people likely to choose to live in Wales and commute into Bristol and the West of England. And we will be certainly be working with the Secretary of State and his team on ensuring infrastructure improvements are prioritised. “More broadly, this change gives fresh new impetus to cross-border collaboration between the Bristol, Newport & Cardiff City Region corridor as set out in the Great Western Cities report published in 2016. And we look forward to the Cross Border Growth Summit taking place on 22 January. For the West of the UK we can and should be making our clear case together and ensuring we are part of the national growth debate.